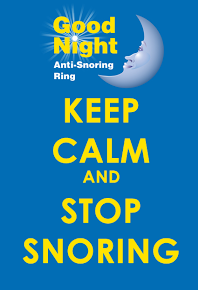 You may remember a couple of months ago I gave you lovely readers a chance to win a Good Night Anti-Snoring Ring. Are you still being kept up at night by someone's pesky snoring? Are you yet to find a solution to your problem? Well fear not because if you weren't lucky enough to win last time, you're in luck now, because I have another chance for you to win one. To have a chance of winning a Good Night Anti-Snoring Ring, you just need to fill out the rafflecopter form below. The giveaway will close at 11.59pm on the 15th April 2014. Please make sure that you enter correctly as all entries and checked and verified. Me - my husband wears one and it's really improved our sleep. my boyfriend. he sounds like a fog horn! I need my sleep!!! me! these really do work I have one, I would love this as a spare as I would hate to lose it. I'm afraid that would be me!! Well, that would be me. I snore so loudly that the neighbours complained to my landlord about it keeping them awake. I would give it to my dad, so that mum can have a peaceful nights sleep!!! My partner is a terrible snorer, so it'd definitely be for him! My grandad as him & my nana sleep separate beds for years. sadly me!! Due to all the meds i take my mouth is very dry at night, so yeah, this would be mine!! LOL!! My husband! Asked him to stop snoring last night and his half asleep reply was "no, I don't want to"!!!! My father, he snores like a drill! it'd be for me, but my husband would wear it. i would love that, LOL. thanks for the giveaway! i hope i win! Myself as (I don't believe it) but apparently I can cause earthquakes during the night. My partner, he snores so loud I hear him while i'm downstairs. Fab competition! My partner would have to have it. He drives me insane with snoring!! I could do with this, my partner snores so loud that you can hear him downstairs. that would be me, the missus would be very pleased if this worked! It would be for my husband, he drives me mad. He starts as soon as he falls asleep and sleeps through my nudges and pushes all night. This will be for my hubby - his snoring shakes the foundations of our house! For my dad to give my step mum some peace! Its for my husband (although "apparently" I snore too). My Partner because his snoring keeps me awake and it doesn't help that at the moment I am currently 37 weeks pregnant so I definitely need my sleep. My husband, he sound like a cross between a hoover and a coffee perculator....not good! My husband swears blind that he doesn't snore. Well he won't be snoring when I win this!! I think I would send it to my dad so my mum can have a good nights sleep! !